University of Florida Health Shands Hospital ranks among the nation’s best in six specialties in the 2018-19 U.S. News & World Report “Best Hospitals” survey released today, ranking highest in Florida in pulmonology and in neurology and neurosurgery. 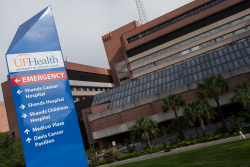 UF Health Shands ranked No. 2 overall among Florida hospitals. No other Florida hospital has more than six specialties ranked in the nation’s top 50. And for the fourth year in a row, UF Health Shands ranked in more adult and pediatric specialties than any other hospital in the state — a total of 12, factoring in pediatric rankings released in June. UF Health Shands’ highest-ranked specialty nationally is pulmonology at 22nd. Also ranked are nephrology (27th), geriatrics (32nd), neurology and neurosurgery (32nd), diabetes and endocrinology (39th) and gastroenterology and GI surgery (46th). Four additional specialties are rated as “high performing,” meaning they ranked in the top 10 percent of the hospitals surveyed by U.S. News. Those are cancer, cardiology and heart surgery, orthopaedics and urology. U.S. News also evaluated treatment involving “common procedures and conditions” at UF Health and rated five as “high performing.” Those are abdominal aortic aneurysm repair, colon cancer surgery, knee replacement, heart failure and chronic obstructive pulmonary disease, or COPD. “These rankings are a testament to the outstanding work and dedication of our faculty, staff and clinical care teams at UF Health in each of our core missions of clinical care, research and education,” said Joseph A. Tyndall, M.D., M.P.H., FACEP, a professor and interim dean of the UF College of Medicine. “We have an unstoppable commitment to excellence." The “Best Hospitals” rankings are based largely or entirely on objective measures such as risk-adjusted survival and readmission rates, patient volume, patient experience and safety, and quality of nursing, among several metrics, according to U.S. News. The new hospital rankings and methodology are available at https://health.usnews.com/best-hospitals.